“They were like, ‘You should just stick to ‘black-ish’, just chill, take a break,’” Martin said. Four years later, it’s almost ancient history for the now 14-year-old sitting in the conference room of Genius Productions, the company she founded, as ‘Little’ releases. The office space is a projection of Martin herself, with accent walls in her favourite colour blue, her and her baby sister’s preferred snacks in the break area (Goldfish crackers, rice crispy treats, etc) and a PS4 in the lobby (as well as her NAACP Image Awards). Her own office is well on its way to having the Alice in Wonderland-feel she wants with “grand plants” and colourful throw pillows. There’s also a very teen-appropriate Polaroid wall, and a perfect view of the Universal sign out the window. 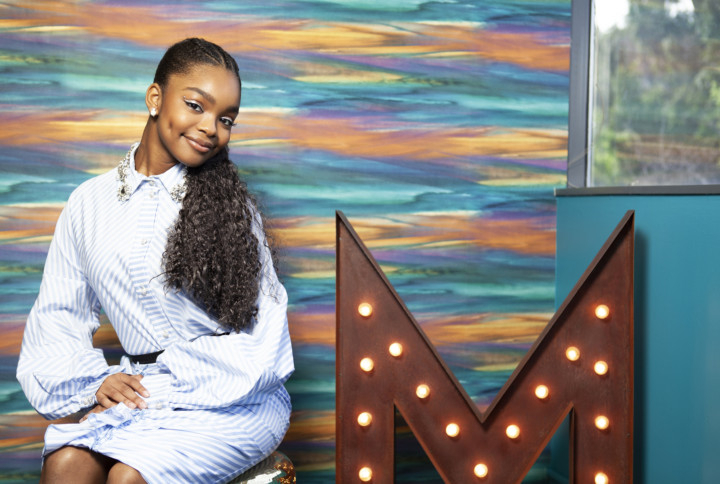 After the break with the agents, ‘black-ish’ creator Kenya Barris helped nudge Martin in the right direction, securing a meeting with his friend, producer Will Packer, who’s been behind such high-profile hits as ‘Girls Trip’ and ‘Night School’, to hear her idea. She stars as the young Jordan Sanders, a science-obsessed teen who is bullied so much in high school that she grows up to be an insufferable bully herself, as the head of a major tech company. The adult version of Jordan is played by Regina Hall, who Martin had worked with on ‘black-ish’. Rounding out the cast is ‘Insecure’s’ Issa Rae (“a creator like me”), as Jordan’s undervalued assistant. When she realised that it meant the studio gets first dibs on anything she creates, she was thrilled. Her life is pretty crazy right now promoting ‘Little’ and developing new films and television projects. She’s home-schooled with a tutor, which she prefers, and she doesn’t have any regrets about missing out on the high school experience. When she does have a moment to unwind, she plays “gruesome” video games like ‘Mortal Combat’, gets facials, massages, cooks and sometimes just watches YouTube. But even then her wheels are spinning about possible collaborations with her favourite YouTubers. ‘Little’ is out in the UAE from April 11.